So when will shale gas caravans rumble into the Empire State? Gov. Andrew Cuomo told an editorial board at the Syracuse Post Standard this week that he expected a “decision” in “a couple of months” on shale gas policy in New York. I credit political convenience in keeping the governor from adding this crucial point: A decision does not equal resolution. Even if an administrative decision is finally reached, it will be merely the starting point for a series of legislative and legal battles that must be resolved before full-scale shale gas development comes to New York State. The Post Standard report of the editorial board meeting, by Glenn Coin and Mike McAndrew, paraphrases Cuomo explaining that “if the state decides to go forward with hydraulic fracturing” it would impose a fee structure to pay for regulatory oversight. It then quoted Cuomo: "Whatever we decide here on hydrofracking, I want people to have confidence in that statement." 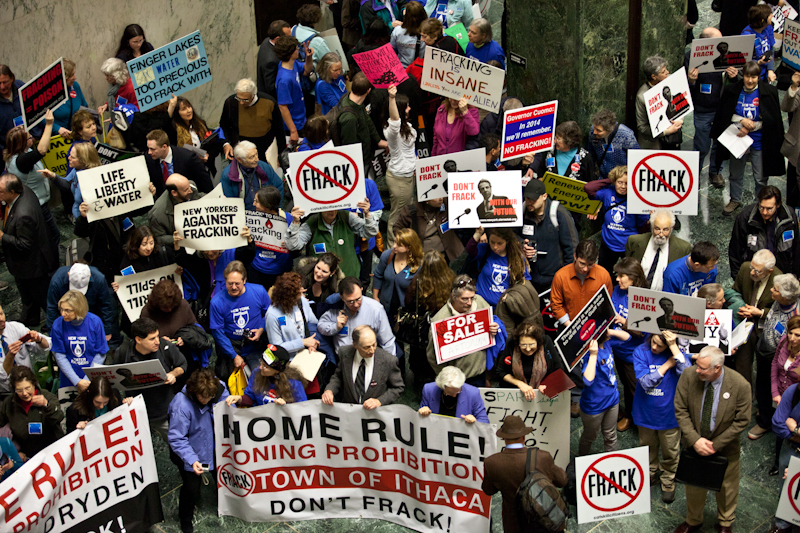 Implicit in these remarks is the notion that the Cuomo administration could also decide against allowing the type of high-volume hydraulic fracturing necessary for shale gas development. But it must be added that, from a legal standpoint, a ban is a long shot. As one source close to the process in Albany told me, the DEC “has a statutory obligation to address permitting in New York. A decision not to would be legally complicated.” In short, it’s a tricky thing to deny rights of a particular industry or person to exploit natural resources on private land, especially given the longstanding tradition of that practice in this country. It’s also far from a sure thing that the state will issue, in coming months, a final version of the SGEIS, the long-awaited policy guideline for permitting shale gas wells. Uncertainty stems from the amount of work that has to be completed to review and respond to tens of thousands of comments, and satisfy due diligence in a process under close public scrutiny and bound to face challengers looking to exploit technical flaws. A more likely scenario is that the state will issue its final draft in the third quarter at the earliest, possibly later. This will serve as a baseline for the legislative and legal battles to begin. Meanwhile, the low price of gas is discouraging the industry from exploring and developing new regions. If and when the price of gas rises, it will drive incentives -- legal, capital, and scientific -- to pry open the doors to yet unexplored reserves under New York. These reserves are attracting a lot of interest. The Marcellus has already been proven along the Pennsylvania border, and the geology suggests that it will bare the same results in upstate New York. International companies, including Talisman and Exxon Mobile, have already paid hundreds of millions of dollars for mineral rights to land in the Southern Tier. The exploitable part of the Utica shale, which is under the Marcellus, extends much further north, well into Central New York. The Millennium Pipeline bisecting the southern part of the state and the Dominion Pipeline through Central New York (including Madison County) provide the backbone of the necessary infrastructure to move the gas. Another incentive: The Utica and Marcellus are near major metropolitan markets in the northeast. They also collectively provide what is known in the industry as “stacked horizons,” meaning that one drilling platform can yield production form more than one pay zone. The shale gas reserves have been there for 400 million years and are not going anywhere, at least before the next ice age. But I’m guessing the political and economic wild cards on which the future of shale gas development rests will continue to offer surprises. It’s hard to know how those will play out, but I can safely offer this prediction: In coming years, policy and the economy – two dynamic variables on which the future of shale gas development in New York rests– will likely be different from today.